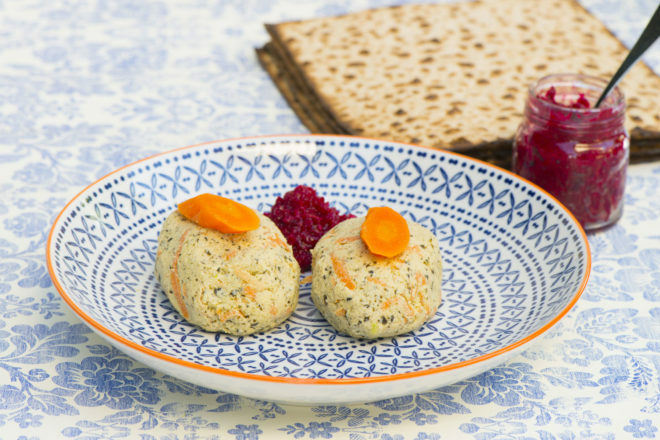 Gefilte fish: Yiddish for stuffed fish, it is a mix of ground fish, egg, spices, onions; usually served topped with a slice of carrot and accompanied by condiments like red horseradish. 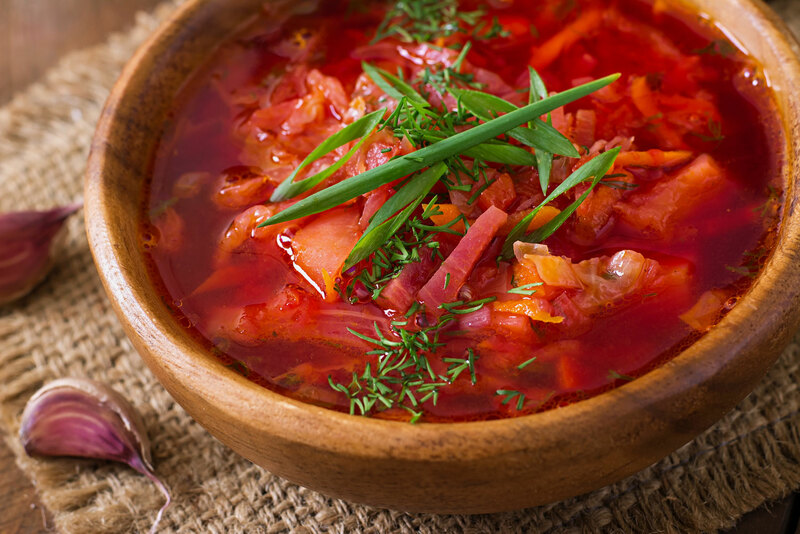 Borscht: A tart beetroot soup of Eastern European origins; the name is derived from an East Slavic word. 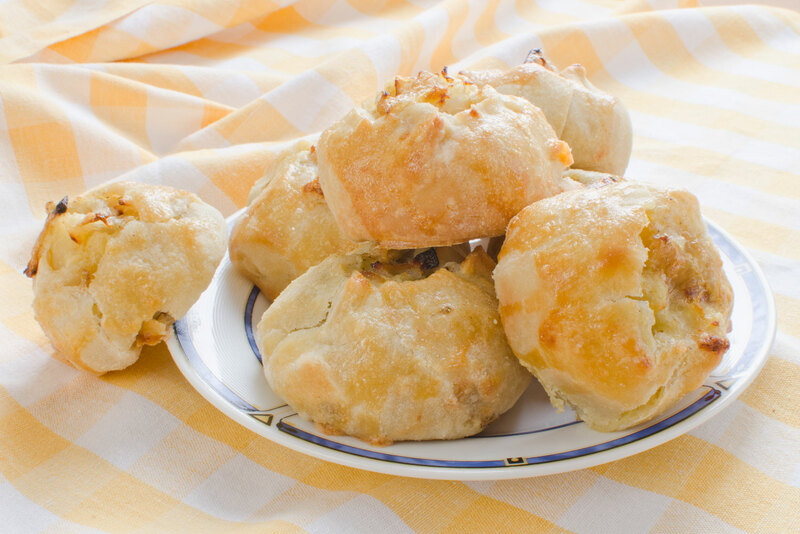 Knish: Originating in Easter Europe; a snack size pie traditionally filled with mashed potato, ground meat, sauerkraut, onions or cheese. 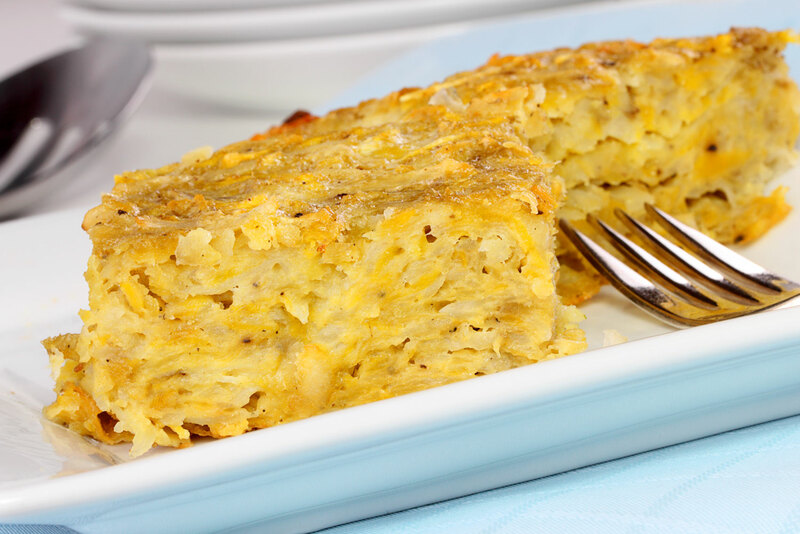 Kugel: A traditional Ashkenazi Jewish dished of baked pudding or casserole usually made with egg noodles or potato. 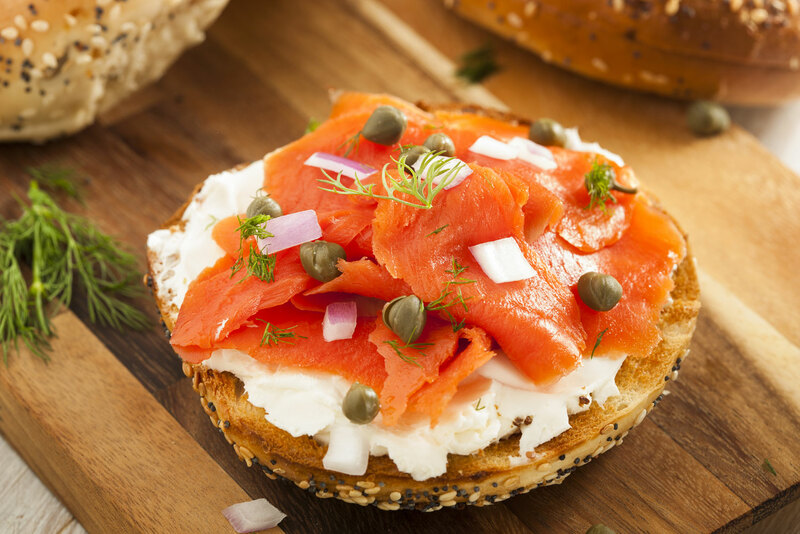 Lox: Derived from the Yiddish word for salmon (laks), it’s a brined fillet of salmon (traditionally from the belly of the fish where it’s fattier and more succulent) most commonly served on a bagel with a schmear of cream cheese. 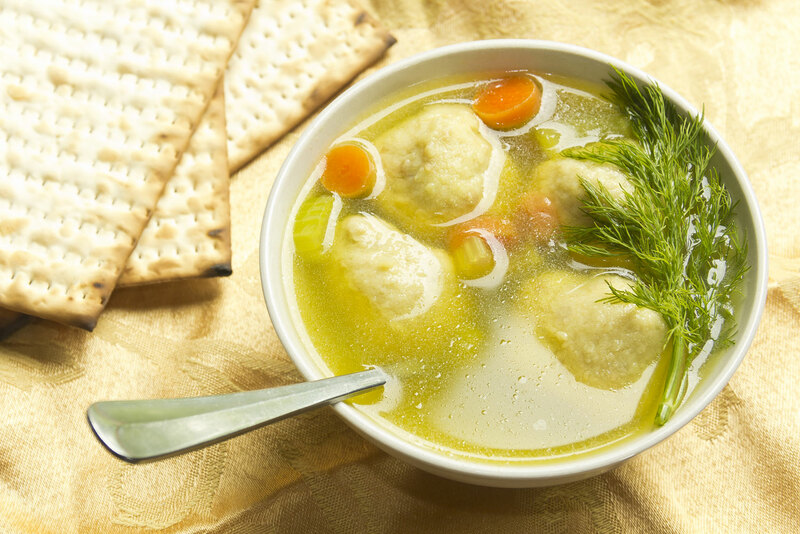 Matzo ball soup: Dumplings made from unleavened flatbread meal mixed with egg, water and chicken fat (known in Yiddish as schmaltz) and served in a chicken broth. 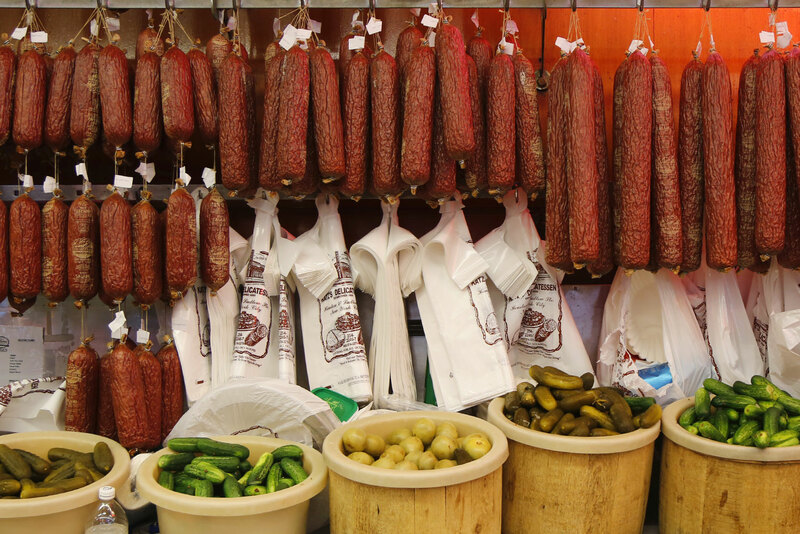 Traditionally served during Passover, it is now a NY deli staple. Pastrami: Katz’s Delicatessen's signature creation involves beef brisket being cured in salt, then rubbed in pepper and spices and smoked, then finally boiled to perfection (it is also steamed before being served); the end result comes sliced thin and stacked high on a sandwich, most famously made from rye bread. Katz’s Delicatessen‘s signature creation involves beef brisket being cured in salt, then rubbed in pepper and spices and smoked, then finally boiled to perfection (it is also steamed before being served); the end result comes sliced thin and stacked high on a sandwich, most famously made from rye bread. Derived from the Yiddish word for salmon (laks), it’s a brined fillet of salmon (traditionally from the belly of the fish where it’s fattier and more succulent) most commonly served on a bagel with a schmear of cream cheese. Dumplings made from unleavened flatbread meal mixed with egg, water and chicken fat (known in Yiddish as schmaltz) and served in a chicken broth. Traditionally served during Passover, it is now a NY deli staple. Originating in Easter Europe; a snack size pie traditionally filled with mashed potato, ground meat, sauerkraut, onions or cheese. A tart beetroot soup of Eastern European origins; the name is derived from an East Slavic word. A traditional Ashkenazi Jewish dished of baked pudding or casserole usually made with egg noodles or potato. Shallow fried pancakes made from shredded potato and served with savoury (cream cheese) or sweet (apple sauce) toppings. Yiddish for stuffed fish, it is a mix of ground fish, egg, spices, onions; usually served topped with a slice of carrot and accompanied by condiments like red horseradish. A dense bread swirled with chocolate or cinnamon and often topped with nuggets of cinnamon-sugar streusel (a crumble made from flour, butter and sugar).